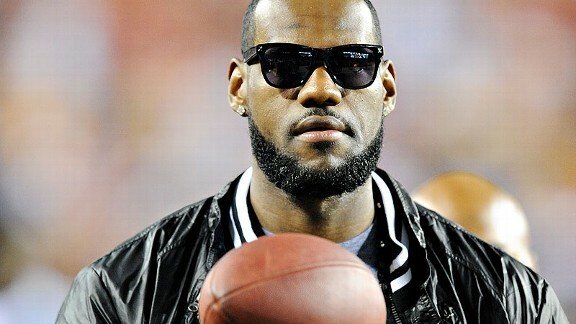 The rumor being bandied about on the internet and throughout the media is that LeBron “I’m taking my talents to South Beach” James is mulling over the possibility of playing in one of the sports he excelled at in High School; Football. The day after NBA Commisioner David Stern announced that the first two weeks of the regular NBA season was cancelled, James tweeted John Clayton asking, “When is the deadline for a team to sign as a free agent”. Clayton, an ESPN/Football analyst responded by saying that there is no deadline for free agents. LeBron replied, ” All Good. Thanks Clayton”. The tweets, which has millions buzzing, were sent just a week after James was seen in ‘Full Pads’ practicing with the football team at his High School, St. Vincent-St. Mary, in Akron, Ohio. Could it be that the self-proclaimed ‘NFL-Caliber Tight End’ will have us all watching another one hour special entitled, “The Decision”- Part 2? Stay tuned. The Giants could use him at Tight End! Ballard is a good work in progress, but if this ‘fantasy’, should ever come true, (and personally I think LeBron is just trying to ‘stir the pot’ in a quiet NBA stretch since the lock out), he would be better as a wide out actually. Too much blocking required as a TE. If you remember Plaxico when he was in his prime and had that super bowl winning catch for the GINTS, well he’s 6′ 5″ and could tower over most SS or defensive backs. Condiser if you will a 60 lb. heavier LeBron, 4″ taller, and a way faster than Burress….But alas, it is not meant to be. Thanks for your comment. It made for one beautiful daydream for me.. I agree with lifestylebygoldie.. TE all the way. He doesn’t have to be the blocking TE on the team. He’d be more in line with Tony Gonzalez or Antonio Gates with his basketball background. Just throw it up above him, he’ll post up, put a hand up and catch it just like it was in in-bounds pass in basketball. I don’t think he could come in to the NFL and run routes as WR and get beyond DBs. He’d be much better as TE with coverage from a linebacker. Nice hearing from thefk1… okay, here’s the thing; I used Plaxico Burress as an example because the two of them are similar in weight and height. Burress is listed as 6′ 5″ -232 lbs. while LeBron is 6″ 8″ and 250. I”m sure you’ve seen LeBron running up & down the court (when he was with the Cavs anyway). He’s beyond quick. Ever see him get back on a fast break? Way faster than Burress in his prime. Without question he could probably play either position. I guess as a TE he would be the fastest TE there ever was. As a WR he’d tower over any DB or SS. I think with his freakish natural athletic ability and equally freakish physique he could pull it off. Also it’s not as if he’s jumping into a completely unfamiliar sport here. He was an all state football player in Ohio. A state known for its football talents. Obviously he’s never played at that level before but that alone is not enough to say he couldn’t do it. the biggest obsticle? Can he withstand the contact and abuse of an NFL season where players will undoubtedly be gunning for him to prove to a point either to themselves or to the rest of us? Good point Dwayne. In the NBA he is ‘protected’ by the refs but in the NFL he would play under a different set of rules. 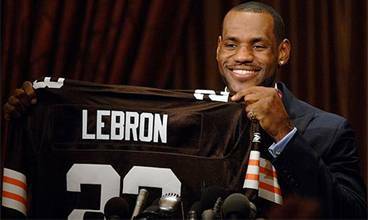 Can you just imagine the TV ratings if he was on any team playing the Browns? IN Cleveland?? I love that awesome picture of LeBron you used in the post. I really liked your decision part 2. Funny stuff, keep up the awesome work. You have a new fan!